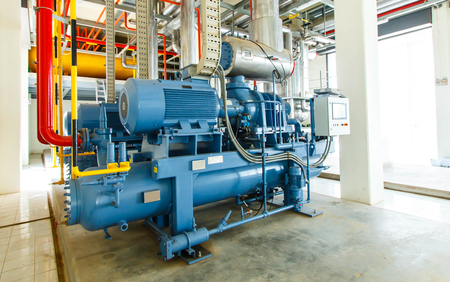 The valves in a centrifugal compressor are responsible for regulating air intake and the bypass air. This regulates the air discharged and also works to prevent surge. Within a compressor, you can typically find several different types of valves that each serve a unique function. Learn more about a few of the most common compressor valves below! This type of valve can be found in a wide variety of industrial applications. In compressors, butterfly valves are often used as air inlet valves. An inlet butterfly may be either electronically or pneumatically actuated. As the butterfly valve closes, effectively reducing the inlet flow and limiting the compressor’s ability to generate pressure and airflow. This type of rotary valve functions similarly to a butterfly valve, but it regulates pressure using a ball with a hole through it instead of a circular plate mounted on a rotating shaft. By virtue of this design, ball valves are able to create a more complete seal than butterfly valves, which makes them ideal for regulating the flow of gasses. They are also generally less prone to pressure drops than butterfly valves. These are mainly used for the blow off function. This is another common type of inlet valve, but its design is distinctly different from that of a butterfly valve. An IGV regulates airflow using a series of radial blades or “guide vanes” arranged in the intake. When the valve is open, the vanes are parallel to the airflow. When it’s fully closed, the vanes are perpendicular to the airflow. As the guide vanes are rotated from open to partially closed, they cause the air to rotate in the same direction as the impeller. This reduces the incidence angle of the incoming air and consequently reduces that amount of energy required to produce pressure. This design characteristic makes IGVs an especially efficient type of intake valve. This type of valve is used to prevent compressor surge. A BOV is also referred to as a bypass valve, but BOVs vent excess air into the atmosphere. The BOV can be found on the intake pipe between the turbo and throttle body. These are just a few of the many components that work together to make a compressor function effectively. At Case Controls, we design and build industrial control systems that optimize compressor efficiency and prevent costly breakdowns. To learn more, feel free to give us a call or contact us online today.